I often say we help people who are in great despair due to traffic collisions, suicides, homicides and many other situations. Please pray for us as we continue to serve the Lord in this capacity. We love what we do, but without God's power we would be useless. Here are some examples of what I mean by the statement above. Back on Father’s Day, we were dispatched by the Pomona Police Department to report to the Pomona Valley Hospital in Pomona to help a family who left their 3 year old in the car seat of their vehicle for several hours. The parents and their other 4 children all went in the house and took a nap and thought she was in the house. When they discovered she was not, they realized they had left her in the car. They went out to the car and found her not breathing, called 911, she was rushed to the hospital where she was pronounced dead. This was one of the hardest calls we have had lately. Please pray for this family. Recently we went to see them and shared the gospel and prayed. They are doing well under the circumstances but still have a long way to go. Many of the calls we go out on, we may not have the chance to share the Gospel at the time but when we go back to followup the Lord seems to open the door. I received a call from the Pomona PD asking me to report to the scene of an accident involving two young men about 18 years old. They had just gotten off work about 4 in the morning and were driving home. The driver was driving at excessive speed, lost control of the vehicle and hit a tree. The vehicle ended up in 3 pieces and they were pronounced dead at the scene. We were dispatched to help the family deal with this. Very difficult one! On another call, a young lady crossing the street was struck by a SUV and the driver took off. We are not sure, but he may have been driving under the influence of alcohol. Did you know that every 15 minutes someone is killed by a drunk driver? Due to the cameras in another intersection they found the driver 4 hours later. The driver was arrested and placed in our jail. Great job by the Pomona Police Department! There were about 20 family and friends on scene that we were trying to comfort. It was about 2 am before we left. We usually wait until the coroner arrives, and everyone leaves before we leave. One evening as Jane was riding with an officer, they were dispatched to a traffic collision that was involving a car and a motorcycle. Jane and the officer were the first to arrive on scene. The motorcyclist was killed. The driver of the vehicle was present. 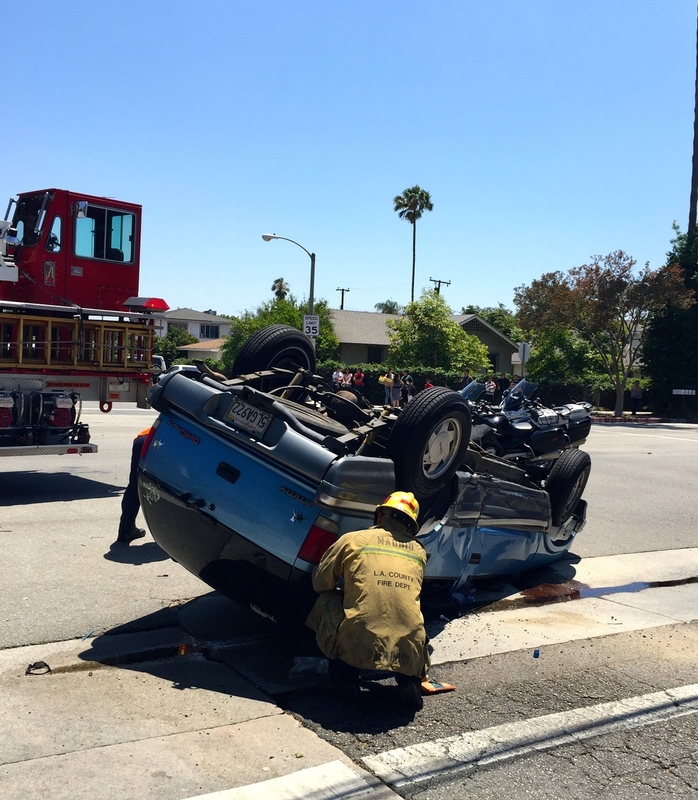 Jane was asked to direct traffic as this happened on a busy roadway. She was also asked to place crime scene tape up to keep people back. It was quite an experience that she will never forget. Jane was able to speak with the driver briefly before his family arrived. One afternoon we were out patrolling in the Citizens Vehicle Patrol car and came across this accident as you can see here. Everyone was okay but a little shook up. We had the opportunity to bring comfort to the family members. Chaplain Tim Sherman from Minnesota was out here visiting and was with me that day. He had the joy of bringing great comfort to a little boy in the vehicle. In fact he went with the EMT’s to the hospital so the little boy could be checked out. He checked out okay. So glad Tim was there to assist me. Our latest call was 187/homicide! Without going into detail, we did talk with the family of the victim and prayed with them. They were very receptive to our visit and hearing the Gospel. In September we are hoping to kick off a continuation course for chaplains. We will be using webinar. Chaplains can call in and continue their training over the computer/phone. We will be covering topics like Post Traumatic Stress Injury, (PTSI), How to Give a death Notice, Emotional Survival Among Law Enforcement and many other topics. The class will be 45 minutes and 15 minutes for Q&A, just once a month. We hope to get speakers such as Police Officers and Chaplains to help us with these classes. We plan to conduct the class from September through June. Appreciate your prayers! If you are interested in joining, please give me a call at 714.865.9177 or email me at rejakeller@gmail.com. There is no cost for these classes! 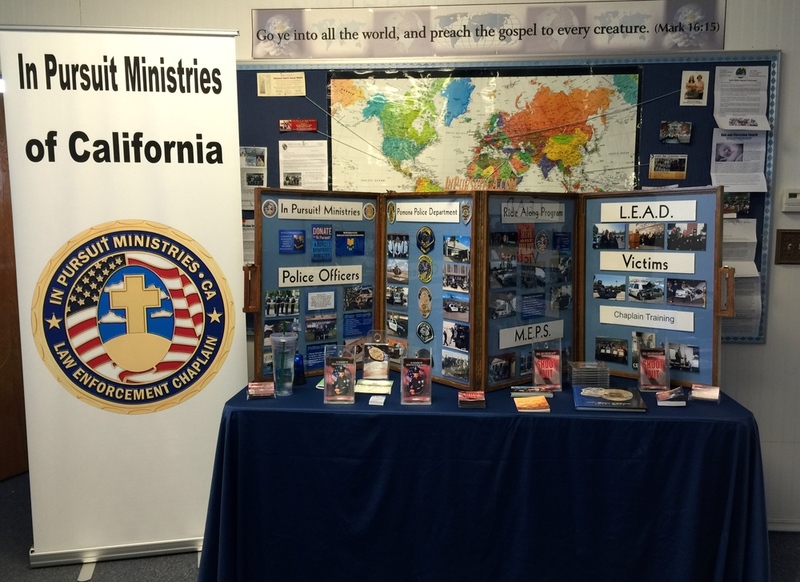 In June we were invited to speak at the Immanuel Baptist Church in Delano Ca. to share the ministry of In Pursuit Ministries of CA. Had a great time and is a great church. If you are interested in having us come just to share the ministry and how your church can get involved, please give me a call at 714.865.9177 or email me at rejakeller@gmail.com. We are not able to be involved at MEPS like we used to be. We were told that it was a DOD decision not to have anyone with a religious connection there. We still have a good relationship with the 1st Sgt. He called us recently to assist an employee who is in the Army, dealing with the death of her Mother. We have met with her and are trying to set up another visit. Pray we will be able to go back to MEPS and once again minister there on a weekly basis. Jane & I both received certificates for attending a course entitled “Individual Crisis Intervention and Peer Support.” This was a 13 hour course on how to deal with people in crisis. Extremely helpful! We also attended a course on "Mental Health and First Aid" This course was 6 hours and was designed to help us better help people who are mentally ill. 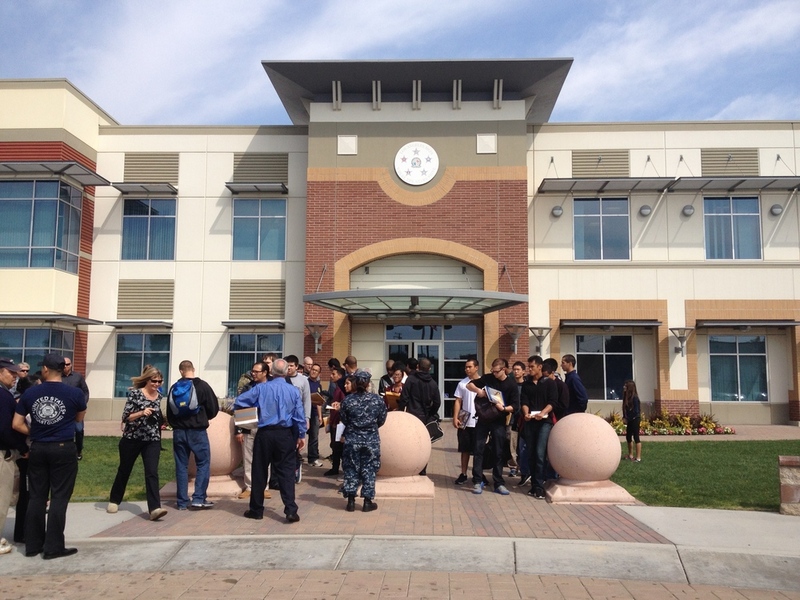 The course was mandatory for all Pomona Police Department personnel to attend. Back in May I attended a 3 day course called "Disaster Relief for Chaplains." This course was designed to train us to help in situations such as hurricanes, tornadoes, floods, wildfires and terrorism. Jane will be taking the same course in September. This last weekend we attended an orientation on how to effectively help police officers who are suffering from "Post Traumatic Stress Injury". This is just the beginning of our training. We will keep you updated on our progress. Did you know that law enforcement officers suffer from Post Traumatic Stress Injury? How thankful we our on June 9th we received a certification of appreciation from the County of LA, Probation Department for our ministry to Pomona Police Department. One last item I almost forget to mention. On July 9th Jane and I celebrated our 44th wedding anniversary. “Whoso findeth a wife findeth a good thing, and obtaineth favour of the Lord.” Proverbs 18:22. Jane is a tremendous wife and partner in the ministry. For those who have supported this ministry for many years, once again we want to say thank you! PS. I hope you can see by this letter that we are busy in the Lord’s work. I hope you consider supporting this greatly needed ministry! Thank you! Posted on July 23, 2015 by Bob & Jane Keller and filed under Blog Updates and tagged newsletter.